Surprise ended its three-game losing skid with a convincing Tuesday win over Glendale. Lane Thomas reached base four times via a single, double and two walks. The right fielder and no. 2 hitter scored twice and plated one. Results from the game played Tuesday, November 13th. Surprise (11-17) utilized 12 hits and eight walks to waltz past Glendale, 9-2, ending a three-game losing skid. The Saguaros have already been eliminated from the division race. The Pirates’ Will Craig led a parade of five Saguaros with a multi-hit effort, going 3-for-4 with a walk. The first baseman and clean-up hitter’s three-run home run capped a four-run first for the home team. Surprise added single scores in the third and fourth then finished their scoring with three more in the eighth. St. Louis’ Lane Thomas was part of that parade and reached base four times. The Saguaros’ number two batter singled and doubled in three at bats, worked two free passes, touched home twice and drove in one. Thomas’ first free pass came in the first, putting him aboard when Craig went yard. The right fielder walked again the next inning but was caught stealing, the second time that frame a Saguaro was nabbed trying to swipe second. In Thomas’ next at bat, he flied out to right with a runner on second but he reached in the sixth via a two-out single. The Tennessee native finished his day with his double, a line drive to center driving in Cavan Biggio (TOR) who reached via a base-on-balls. Thomas subsequently scored his team’s third and final tally of the frame when Bryan Reynolds (PIT) singled to right. 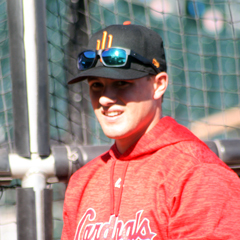 Tommy Edman, the Cardinals’ only other player in Tuesday’s game, was on the other end of the productivity scale. The third baseman went hitless in five at bats, including grounding into a double play and being caught looking at strike three once. Defensively, he took part in one of Surprise’s two double plays. Toronto’s Nate Pearson scattered four hits and two walks over five scoreless frames, picking up his second win in four decisions.